In case you missed our earlier posts, Disney’s California Food and Wine Festival is an event that runs from April 24 to June 7, 2009, which adds various food and wine events to the Disney parks (both complimentary and “signature” paid events). You can see a promotional video here. Among the signature events are Festival Wine Receptions, which are available by reservation on certain Friday, Saturday, and Sunday evenings from 7:30 to 9:00 p.m. The receptions offer a variety of wines and hors d’oeuvres in a pretty little patio area at the Golden Vine Winery at California Adventure. Reception admission is $55 per person, and because it’s held inside the park, that price is in addition to regular park admission. Mary and I got free admission to the park (sadly, we didn’t know until we got there in the early evening) and reception. We got to the reception about half an hour in, since we had checked out some of the other festival offerings while we still had some daylight and energy to burn. Lamely, I didn’t write down a lot of the details while we were there, so my description of will be missing some details that maybe Mary can fill in. There were three tables of wines (I think around 20 wines total), and there seemed to be two tables for California wines and a third with a hodgepodge of wines from all over. I really was not keeping track of all of the wines they offered, and all I can remember are a couple of Bridlewood wines I didn’t try, and a MacMurray Ranch pinot gris. Mary and I are both pretty wine ignorant, so that’s all you’re going to get from either of us on that subject. The part we really cared about, of course, was the food. 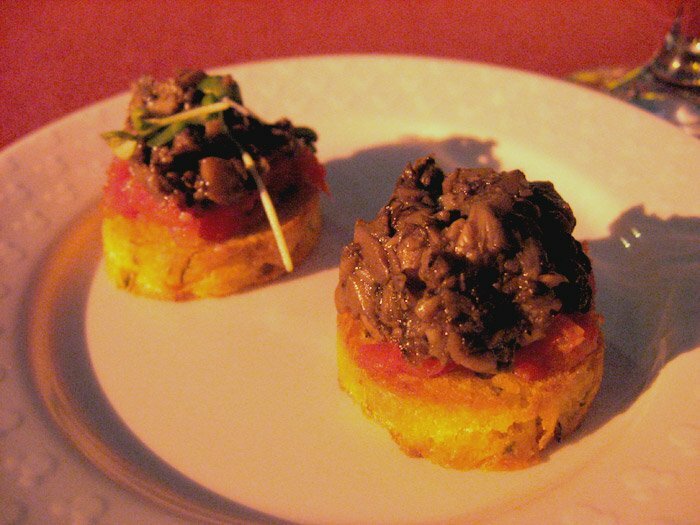 Of all the reception’s offerings, probably the least favorite for both of us was a small polenta cake topped with a tomato mixture. Loved the topping and hated the polenta cake, which, maybe to help the polenta hold up under a moist topping, was so dry and toasty that I couldn’t even tell it was polenta. It would have been better on a cake where we could taste the polenta, or on a toast point, so we would not have the disappointment of expecting polenta and tasting none. All of the other food was much better. They had some type of Asian barbecue beef skewers that were very tasty in a simple way. 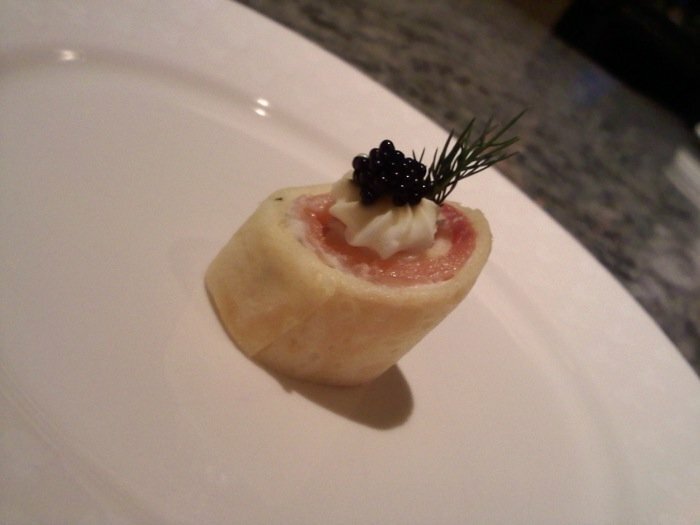 There were also rolls of smoked salmon in pieces of crepe, with dill cream and caviar. I liked them well enough, though I’m pretty sure Mary was not a fan. My biggest problem was that the crepe seemed a little too soggy, but they were otherwise decent and they looked really lovely. Another hors d’oeuvre, a butter poached lobster and mozzarella quesadilla, was one of my favorites. It had a bit of a citrusy flavor and tasted really light even though it was oh-so-cheesy. The last thing we tried that night was the cheese plate. Of course we expected it to appeal to our cheese-loving ways, but I don’t think either of us had really high expectations. Despite loving cheese, I don’t have a lot of cheese knowledge and will only be able to proffer a mediocre description of what we ate. We had our choice of starchy cheese vessels (i.e., crackers of various types and small bread slices) and three cheeses were available. One was a very mild, creamy white cheese that I thought was okay, but Mary didn’t like it at all. Another had a texture and flavor more like a mild cheddar or something, which was more what we expected and very tasty in a snacky way. The third cheese proved to be our favorite food item of the entire reception. It was some type of a stinky cheese, like a super-mild bleu cheese (maybe Stilton?) topped with a piece of honey-laden honeycomb. It was amazing. It made all of our wines taste better, and it made us happier, better people. I’m sure all you cheese connoisseurs already knew about this stinky cheese/honey combo and never told me, but at least I didn’t die before I tried it. Overall, the reception was really enjoyable and it was interesting to try so many treats. I’m not sure I would pay the extra $55 after entering the park to attend this on a normal amusement park type of day, especially since I feel pretty sticky and gross after riding a bunch of rides. However, if you’re an annual pass holder stopping in for the evening, staying in the Grand Californian Hotel, or wanting to make a park day more of a grown-up event, I would definitely recommend it.